I used a fun image called "Parked" (Digi 9303) and here's what I did with it. 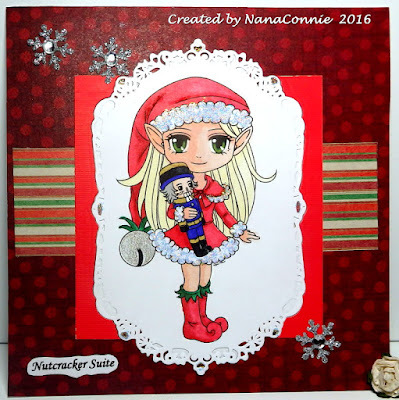 I used my ProMarkers to color the image and then cut it with my newest, stitched die (Die-Versions.) 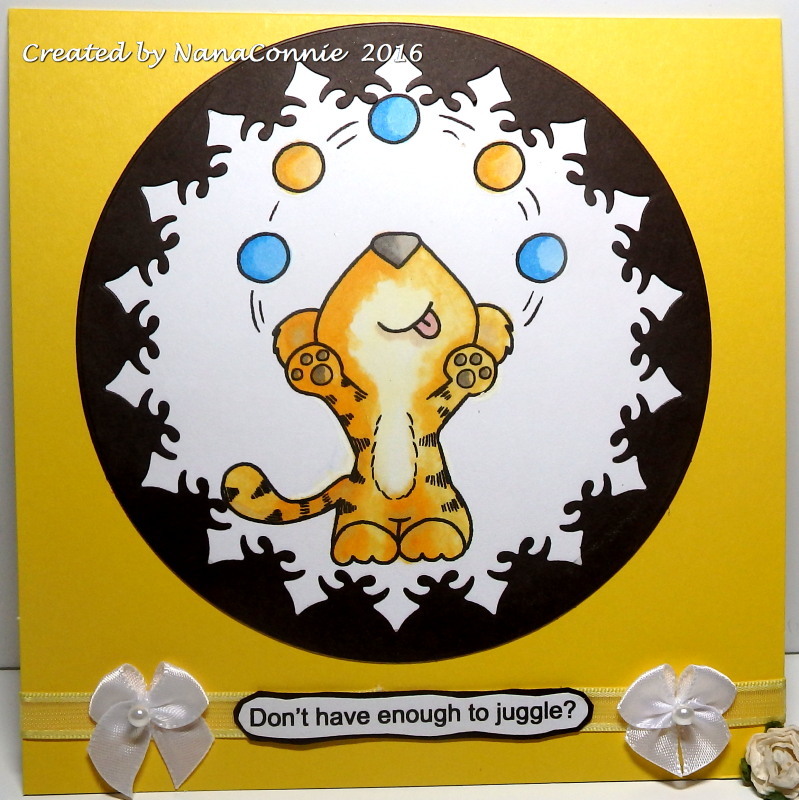 The sentiment is also cut with that same die set and the splash of honey yellow on it was done with a marker. It really pulled in colors from the dp and the broom. The plaid ribbon was in my stash and I used the very last of it to tie the bow. The rusty-orange CS is embossed with my "Linen" folder and everything is layered onto a kraft card base. My daughter absolutely loves nutcrackers inspired by the traditional Christmas ballet, "The Nutcracker." I can hardly blame her since that's one of my favorite ballets, and is one in which I danced during my childhood years. Wonderful memories sweep over me whenever I hear any of the music from it. 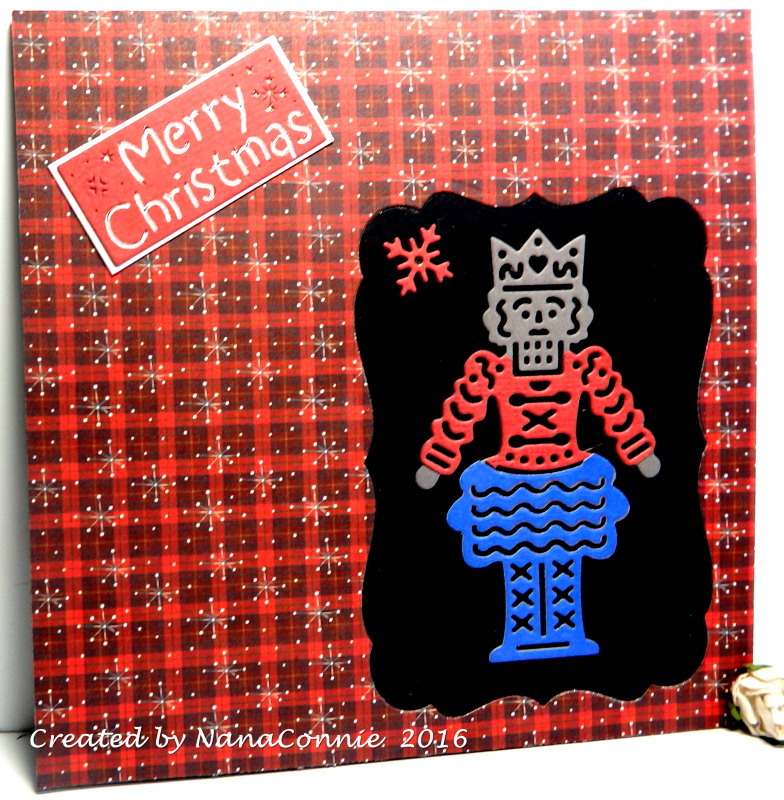 The Nutcracker is made with a Die-Versions die, cut three times in different colors, then put together. The plaid paper is cut with a window (the black CS is behind the image and the plaid dp) and that's a die from Spellbinders. The little snowflake and the embossed sentiment are done with dies from Cheery Lynn. 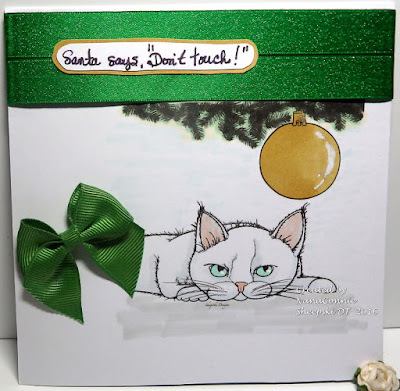 I used a white marker to highlight over the embossing on the "Merry Christmas" so that it stands out a bit more. 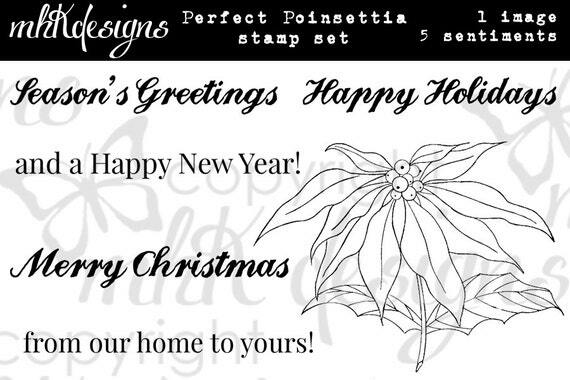 I kept this design very CAS so it can be easily mailed. I'm about half-way done with all the Christmas cards I need for this year and time is getting short! Remember a few days ago when I said I had done my last Halloween card for this year? Well, I got talked into making another one or two so I'll share this one with you today. One of the best parts of the holidays is the baking of dessert goodies. The whole house smells so fabulous, baked goods are eaten while they're still warm, and the kitchen is the favorite room of family and guests alike. Our family has an award winning fudge recipe which has been passed down from Mother to Oldest Daughter through at least 5 generations now, and I can remember my mother whipping it into fudge frosting for cupcakes. Mmmmm, so good, but the fudge all by itself was pretty wonderful, too! So I'm celebrating those childhood candy and baking memories with this one little card. 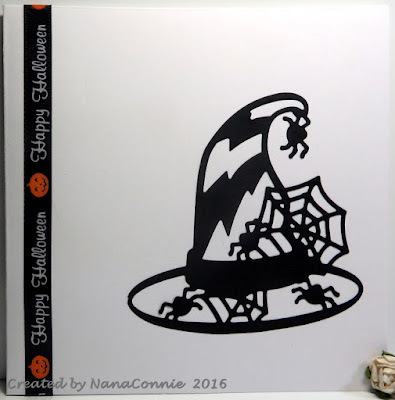 The image is from Angie's Digital Stamps and I'm entering their challenge this month. I colored that darling little baker mouse with my ProMarkers, then cut him and the mat/frame with my newest die set, "Double Running Stitch" from STAMPlorations. I love that die set and you're going to see it getting lots of use. I dug out a scrap of ribbon and tied it diagonally across one corner of the image, then added the bow. The background dp was done with left over scraps which came from my 12 x 12 scrapbooking papers. I'm not sure how long the scraps have been waiting to be used but I know I bought the papers more than 2 years ago. 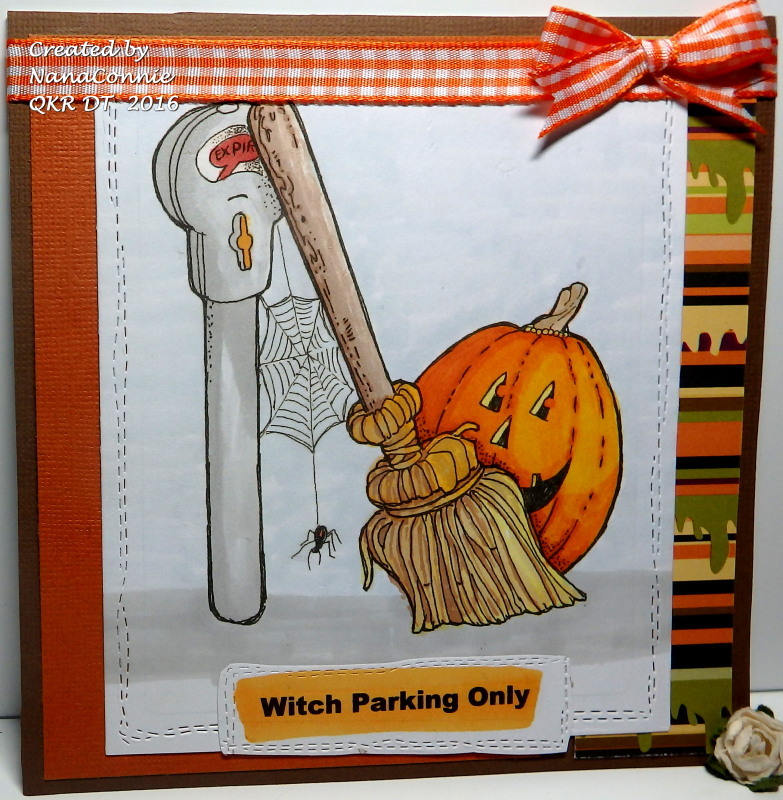 Well, if you've been visiting each day this week, you've seen all five of the new October releases from MHK Designs. Today, our new challenge starts and we have a beautiful Inspiration Photo for our theme. 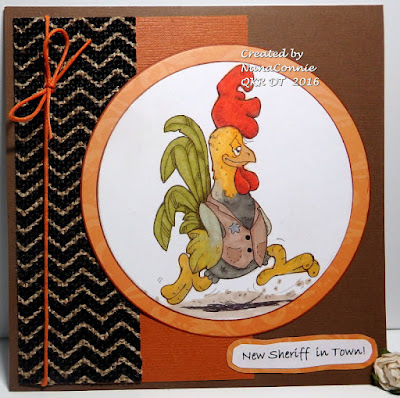 You can find that photo on the MHK Designs blog or look at the bottom of this post, next to the photo of the Chicken In set. 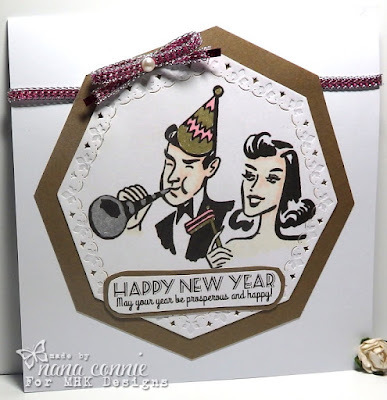 Remember, you are not required to use an MHK Designs image on your card but if you do, then the challenge theme is "Anything Goes" and you need not use anything from the inspiration photo. This image is the second one from the newly released set, "Chicken In." The other ones are the Rooster and the Chicken Wire I used earlier this week. I colored it with chalks and ProMarkers, the cut it with a die from Spellbinders. 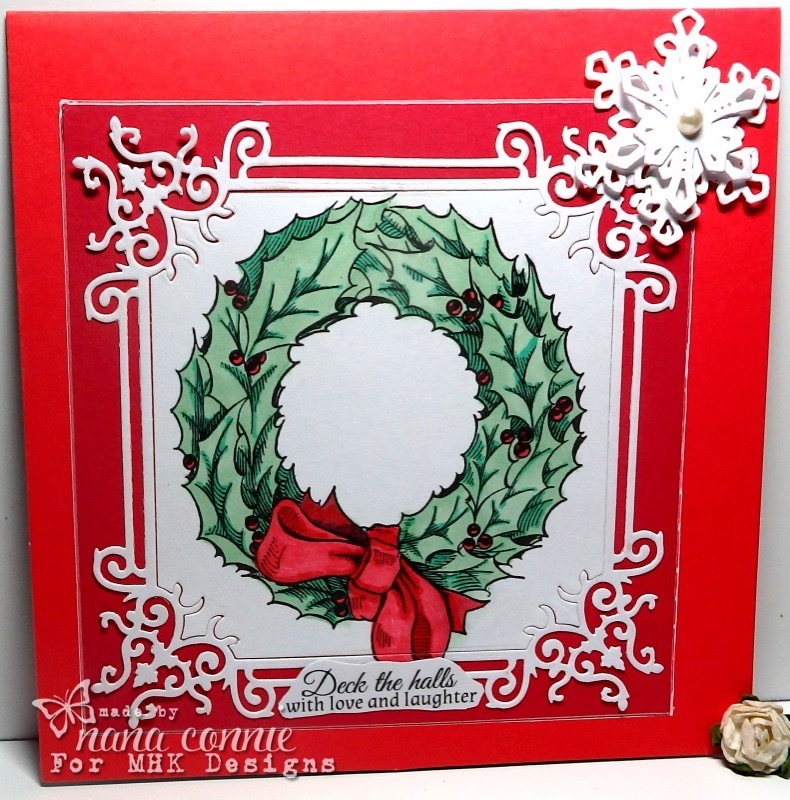 The dp is also from an MHK Designs set, called "Holly Days." In order to get that look, I reduced the height of the paper and lengthened the width slightly, in essence squashing and stretching it. This is a relatively new technique for me and I love the way the pattern looks. I've adjusted the size of digital dp before but always kept the ratio of height and width; never before have I squashed and stretched it. I've just found a new reason to love digital dp. :-D The digital paper was printed onto a scrap of white CS, then I punched the corners with a Fiskars punch. The sentiment was also printed on a scrap but it was hand cut and matted with another scrap. The ribbon was 'reclaimed' from another project which was headed for the trash can and I think it is a perfect complement for the dp and coloring. The sentiment is also from Chicken In set. I decided to use the Sweet Sketch Wednesday 2 sketch again. I colored with ProMarkers, utilizing fall colors, then die cut both the image and the dp mat with dies from QuicKutz. I hand cut the sentiment and matted it, too, with a tiny scrap of that same dp. The card base is made with brown CS and the orange CS strip was embossed with my "Linen" folder. The black chevron striped paper is actually burlap. 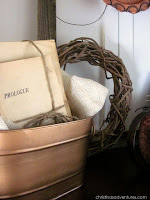 I added the orange jute cord and the card is perfect for a masculine birthday or other celebration. In order to have a CAS design, the image was printed directly onto the card front and then colored with my ProMarkers. The sparkly ribbon is from Really Reasonable Ribbon and I hate to admit that it's been hiding in my ribbon stash for nearly 2 years! In my defense, I had put it into my Christmas ribbon stash and the bin got pushed to the back of the cabinet. I added the sentiment to the ribbon and turned my attention to embellishment. I decided on just a single bow but a large one. The bow I picked was originally white but I 'dyed' it with a green ProMarker. Fast and simple; a real 'git 'er done' card and now I have one more in the Christmas stash. 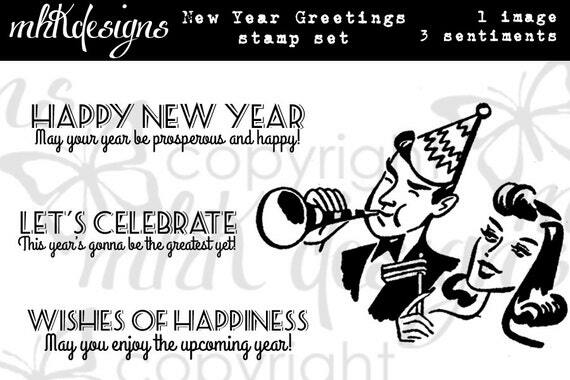 This is the last day of the October release from MHK Designs and we're giving you a head start on New Year Greetings, which is the name of this set. Yes, I know it's early but I always get so caught up in Christmas that I often forget about the New Year. This year, I've already gotten 5 cards done, all using this particular set. Here's the first one I did. I really like Mynn's retro image which I colored with ProMarkers and metallic gold and silver ProMarkers. Hard to see in the photo but it gives a spectacular shine to the card. I die cut the image with a die from Spellbinders, and then framed it with another plain octagon die cut (QuicKutz.) That's metallic gold paper which also adds some shine. The ribbon is metallic and I added a simple white pearl to the bow. The sentiment is part of the set (see photo below) and I matted it with the same gold paper. 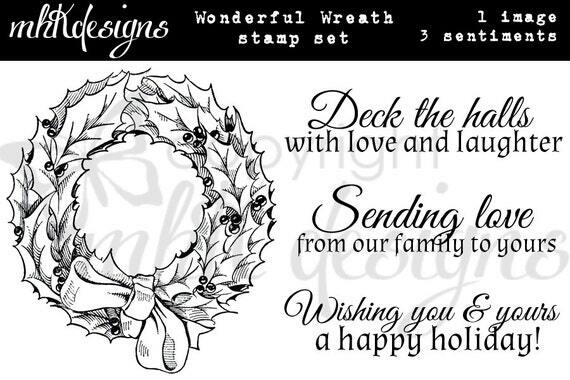 OK, it's Day 4 of the MKH Designs October Release and, as promised yesterday, I'm sharing another Christmas card. 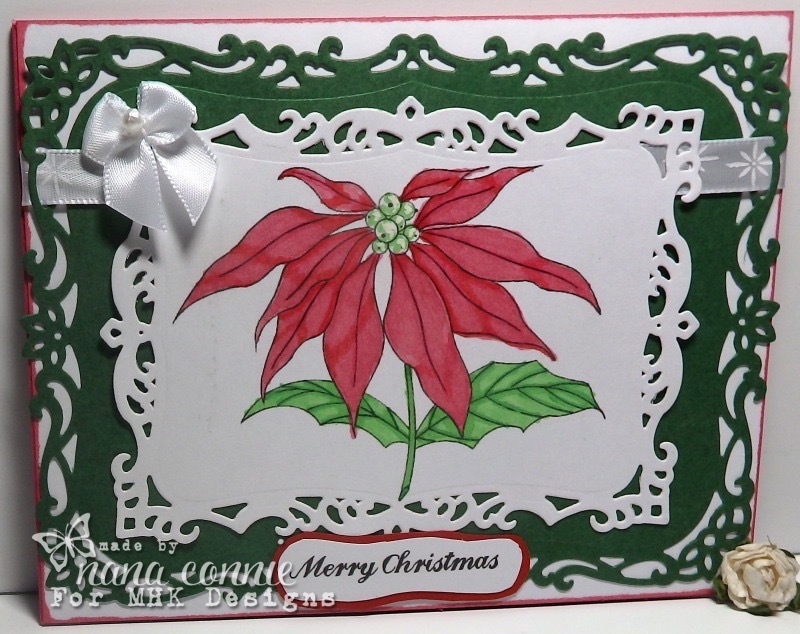 I used the image and one of the sentiments from today's new set, "Perfect Poinsettias" and I just love how this turned out! 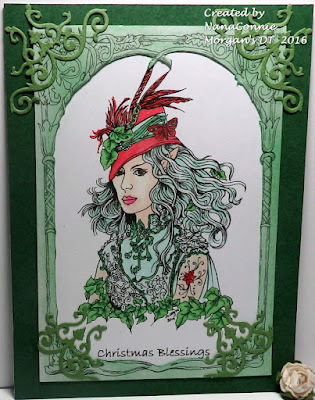 Today I colored with my ProMarkers, then die cut it and the Hunter Green frame with two of my framing dies from Spellbinders. I threaded white satin ribbon through the larger frame and added one of the bows I sew by the dozens, each with a pearl. The sentiment was printed, hand cut and matted, then hand cut again. This is Day Three in the October release at MHK Designs and we're thinking Christmas for the next two days. 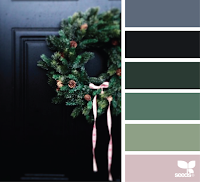 Today's set is called "Wonderful Wreath" and it's such a classic Christmas image. You'll find a photo of the complete set at the bottom of this post. 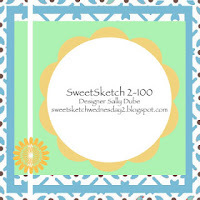 I started by using the sketch at Sweet Sketch Weds. but I turned it halfway around. I used my watercolor pencils and gamsol to color this time but I'm using this same image for a few more cards and I'm coloring each one with a different medium. I'm thinking I'll include watercolor paints, alcohol markers, and my Lyra Polychromos pencils at a minimum. I'll share those as I get them finished. 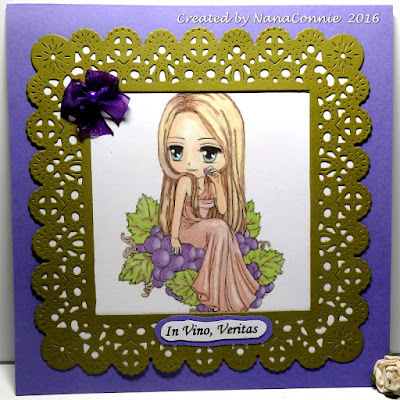 Once colored, I used a die from Spellbinders to cut the image and the frame. I mounted those, inlaid together, onto deep red CS and then put that onto a lighter red card base. In order to have some differentiation between to two shades of red, I drew a white border with a fine-point, gel pen. The snowflake was made by die cutting (Spellbinders) the various layers and fastening them together with a pearl brad. I still wanted the overall design to be on the simple side so that snowflake is the only embellishment. Finally, I fussy cut one of the sentiments and added it to the bottom of the framed image. 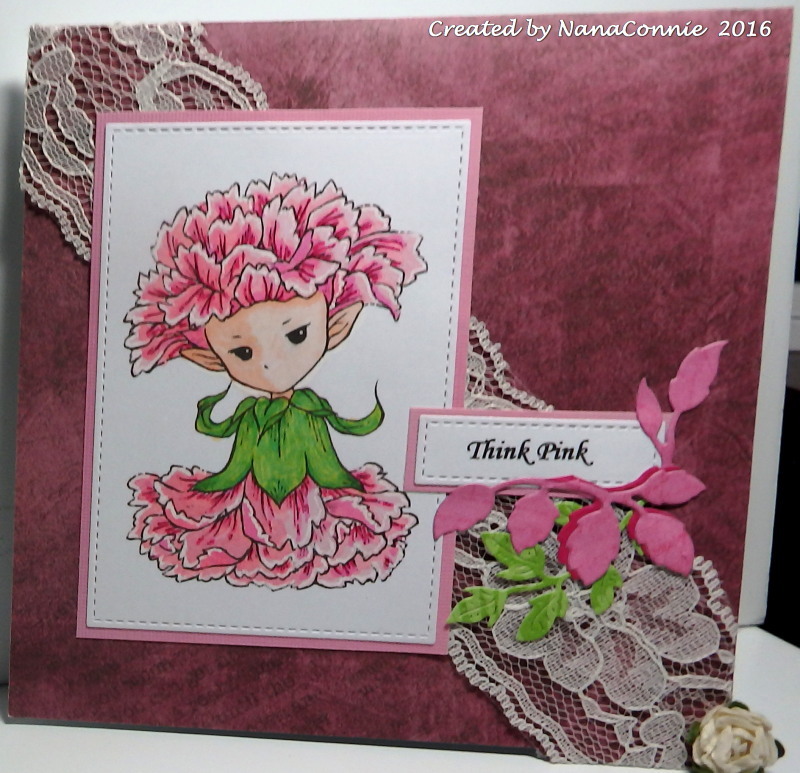 I was thinking of my blogging friend, Linda (Linda's Crafty Piece of Heaven), when I made this card. She does such incredible masculine vintage cards and I love every one of them. Actually, she does heavenly vintage cards and many of them are masculine! Thanks for all that marvelous inspiration, my friend. 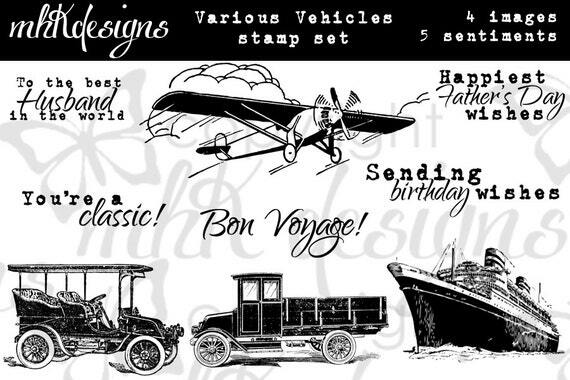 This is the second of our October release sets at MHK Designs and the set is called "Various Vehicles." You will find a photo of the complete set at the bottom of this post. 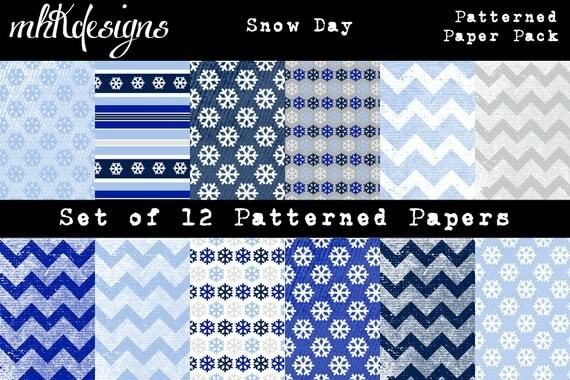 I also used "Chevrons" from the "Snow Day"set and a photo of it is at the bottom, also. 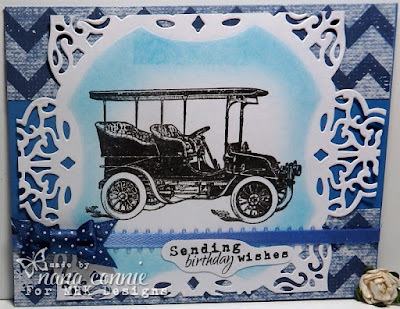 Although the car itself isn't colored, I used one of my dies from Spellbinders to cut it and chalked around the image while it was still in the die. Because the die cut piece was larger than my card base, I trimmed it to fit an A2 style card. 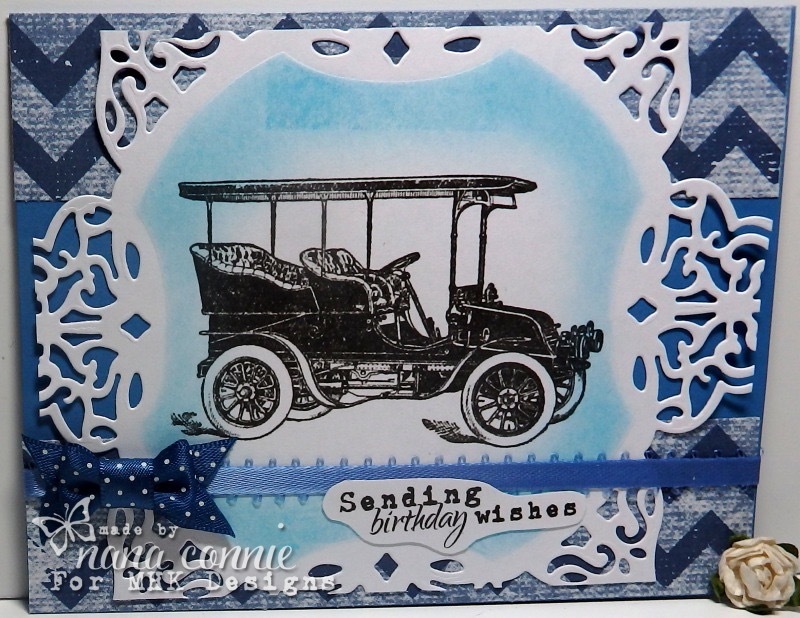 I laid two strips of the chevron paper onto a blue card front and then added the image piece. I dug through my stash for some blue ribbon, wrapped it around the card front and layered the sentiment on top of the ribbon. The final touch was one of my bow ties made with polka dot ribbon. 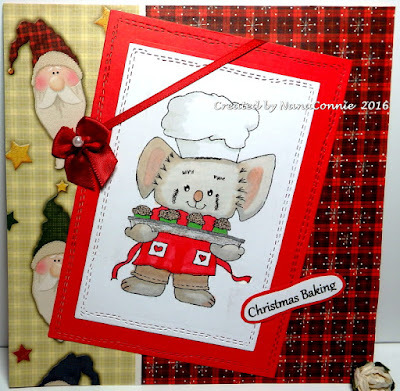 Be sure to visit the MHK Designs blog and then visit all the other designers to see what they've done with the images from this set. They are so many different ones that the set is very versatile and so great for masculine cards. The distressed chevron paper really works with any of the vintage images. 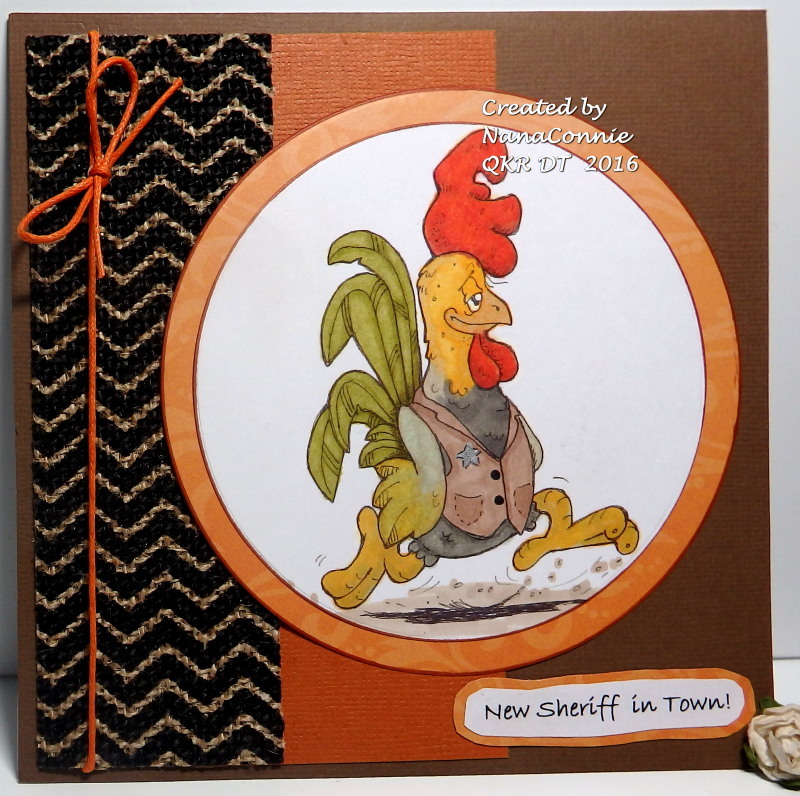 Today starts the October release at MHK Designs and our first set is called "Chicken In." 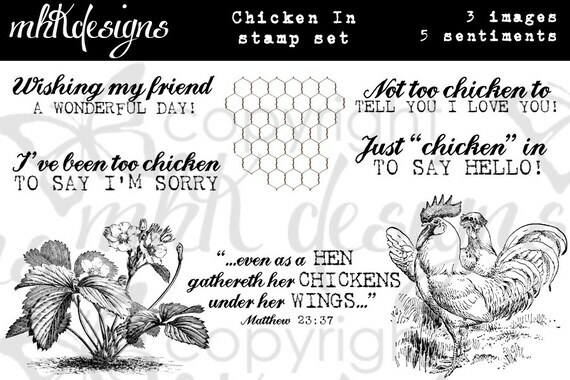 I've used two of the images (rooster and chicken wire) plus one of the sentiments. 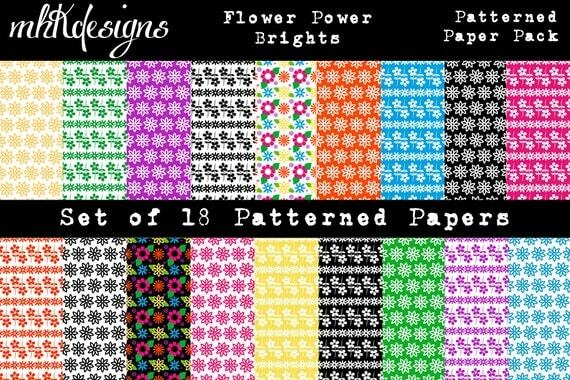 I also used "Darling Daisies" dp from the "Flower Power" digital paper set. Photos of both sets are at the bottom of this post. I love the simple design of my DT card -- all black and white with only one tiny pop of red. Very little coloring was required on this one but I did use my ProMarkers on the rooster's comb. I fussy cut the images and the sentiment and layered them all on top of the two dp pieces. Everything went onto a black card base. 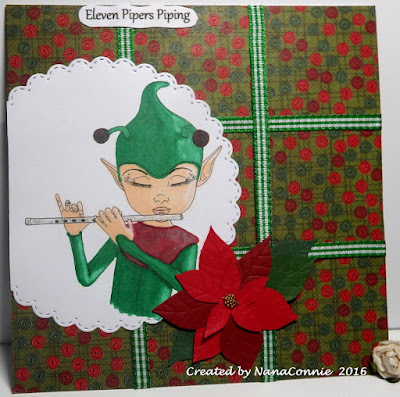 OK, if you read the title of this post, you're already looking for the other 10 pipers. Don't bother. They headed out for the pizza parlour! After a long day of piping, they were more than ready for dinner. I started with this week's sketch from Sketch Saturday. The image came from Scrapper's Delights for their monthly progressive challenge on FB and I used my ProMarkers to color the piper. His flute is glittered and sparkly. I cut him with one of my Stitched, Scalloped Circle dies from Memory Box and trimmed one edge to match the sketch design. The poinsettia is made with more die cuts (Die-namics) layered together. I cut two different red CSs and one green CS, and embossed them with a stylus. I used the flower as the one embellishment and called it done. Perhaps not exactly CAS in style but flat and easily mailed. It's TGIF and we have a new challenge starting today over at QKR Stampede! Our new theme is "Pumpkins" and we don't even care if they are really Jack-o-Lanterns. :-D If you're still doing Halloween cards or Thanksgiving cards and they have pumpkins on them, come enter our challenge this week. 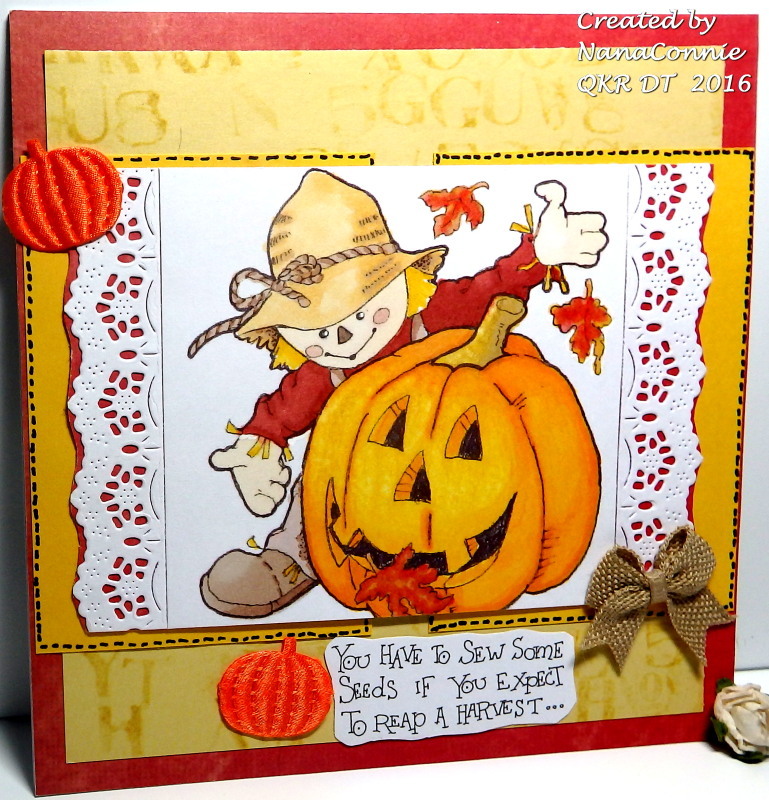 I did my card using Digi 18807 "Scarecrow and Jack" and the sentiment is Digi 15804 "Sewing Seeds." The image is colored with ProMarkers and cut with one of my very first dies, a simple square from Spellbinders. The lacy edges were with a border die from Cheery Lynn. The dp and the CS pieces are all scraps (still clearing the mess off the craft desk!) and I added the two fabric pumpkins for embellishment. The final touch was the burlap bow. Another challenge is starting right now at Morgan's Artworld and this time around, we want to see you "Frame It." 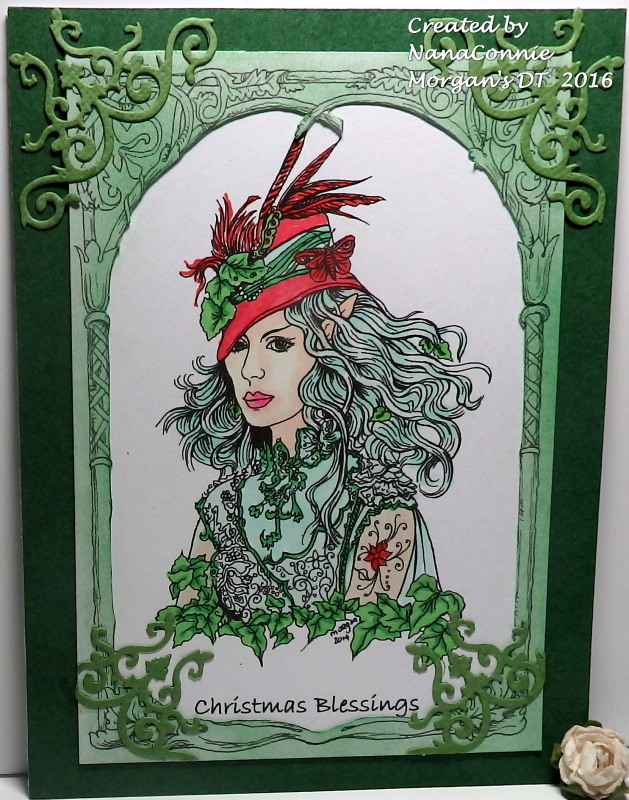 I've added one more Christmas card to my stash while using two different Morgan's images: "Ivy Greenleaf", a beautiful woodland elf, and "Gothic Border." Clicking on either name will take you to that Home page. Then you can find those by simply using the search tool at the top of that page. I printed Ivy onto heavy white CS and colored her with ProMarkers and used aqua chalk on her dress and hair. Next, I printed the Gothic Border, trimmed out the inside, and colored it with aqua and green chalks. I laid the frame over the image and mounted both pieces onto darker green CS. I added the decorative corners, which have been cut with a corner die from a die set by Spellbinders. 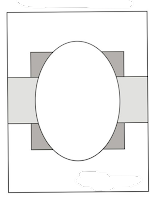 This is a little different from my normal style (if I even have one) because there's no colored image, just die cuts. 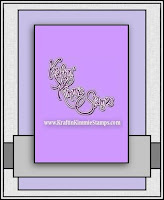 But that makes a card which is not only CAS but very easy to mail with very little bulk. 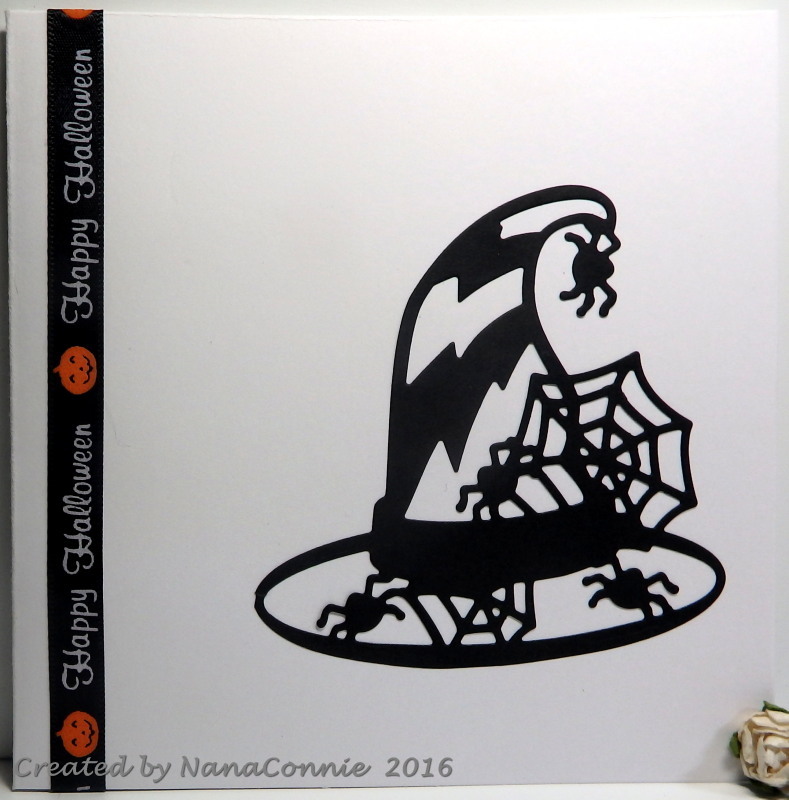 The witch hat and the corner spider web are both cut with Cheery Lynn dies. On the hat, I added the hatband by inserting a tiny scrap of dp. The clock is cut with a Die-versions die and I had to actually place the clock hands onto the face myself so that it was almost midnight. That took some skill with teeny-tiny tweezers! 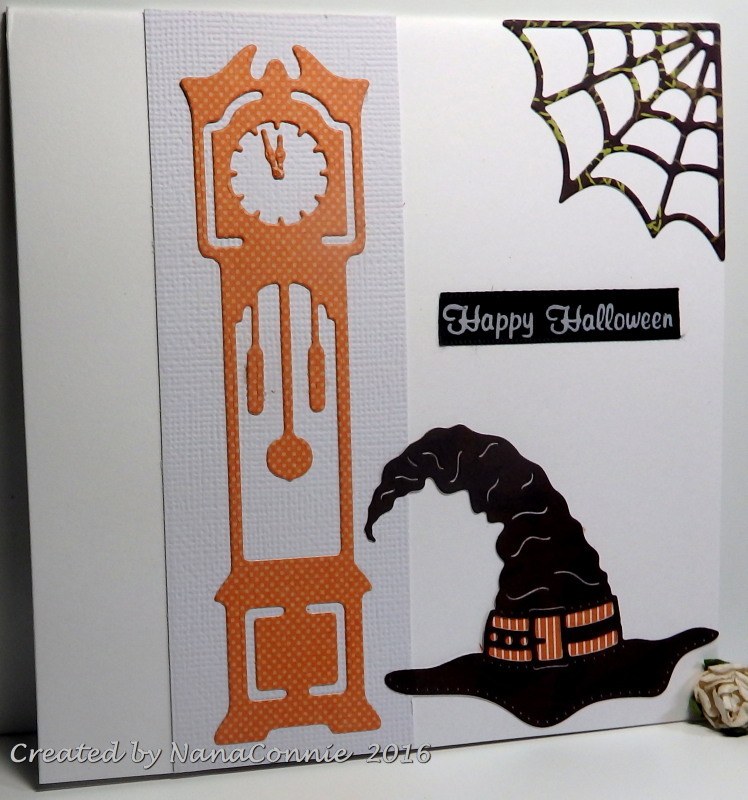 ;-D I mounted the clock onto 'linen' embossed CS before adding it to the card front. All of the shapes were cut from small scraps, ready to go in the waste bin but saved from that fate by the dies. :-D The sentiment is also a scrap but ribbon, not paper. My daughter has collected Christmas nutcrackers for many years and I've contributed my share of them to her growing collection. 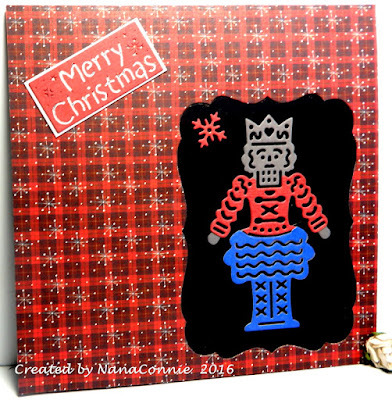 But I've never done a Christmas card for her with a nutcracker image so this year I've done two different ones and now have to decide between them. :-D This is the second one and I used the image from the Progressive Challenge at ArtbyMiRan. I used the sketch at Come and Get It. I started by coloring the image with my ProMarkers, then die cut it with a die from Spellbinders. I dug out a couple of snippets of dp and red CS, then layered everything together following the sketch pattern. I did reverse the position of the red square and the striped dp strip because it just looked better this way. I added sparkle gel ink to the bell and glitter to the fur on her costume. I printed the sentiment on the computer, fussy cut and adhered it, then added the three, glittery, snowflakes for embellishment. New DT Spot with Ike's Art! I'm thrilled and excited to announce that I'm going to be working with the DT at Ike's Art! 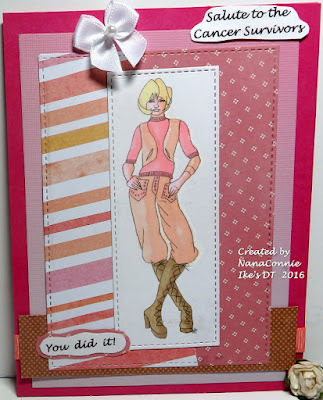 This is my card for the Ike's World Challenge which starts today with a theme of "Girl Power" and with this theme, we are also honoring all the women who have fought Breast Cancer. I used "Fashionista." I based this on the October sketch from Kraftin' Kimmie. I colored the image with my Lyra Polychromos pencils, sticking with a color combo of pinks, and doing my best to improve on my shading and highlighting techniques. I'm learning slowly but shading with pencils is so very different than doing it with alcohol markers! I cut the image with one of my Stitched Rectangle dies from Die-namics. I also pieced together two different bits of dp, then used another, larger, stitched rectangle die on those and used them as the background for the image. All the other papers and CS were scraps left on my desk from another project (I'll post that project in a few days) and the ribbon was also a scrap left in my stash. The white bow was the only embellishment this needed. I did sentiments which I knew would be encouraging to any cancer survivor. I remember the cards and prayers I got when I was undergoing my own battle with breast cancer (15 year survivor now!) and how much the love and encouragement meant to me. I clearly remember those days of being a working Mom and homemaker, a college student, and a wife, and trying to keep all the balls in the air without dropping anything. This darling little tiger by Gerda Steiner brought back many of those memories. :-D The image is this month's freebie offered to all who play in the Progressive Challenge at The Outlawz. The image is colored with my ProMarkers and, although it looks die cut, this time it's the black CS that's actually die cut. That was a leftover negative from another project and I put it on top of the image, and then used a plain circle die to cut both of them. 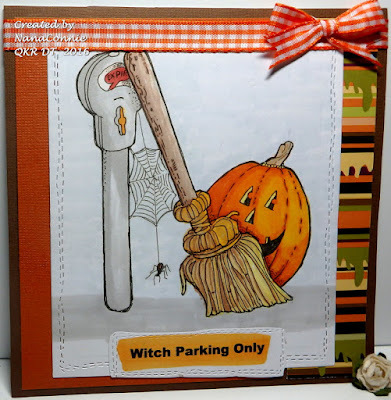 I layered those onto a pale orange card base, added sheer ribbon, and then adhered the matted sentiment. I used two of my hand-sewn bows and called it finished. I was looking through my collection of autumn images and ran across this one from ArtbyMiRan which I'd not used before now. I remember when I got it, it seemed that I had to have it right then! Unfortunately, it got downloaded and went to right the back burner. :( But now I'm using it as a salute to the autumn grape harvest going on in the wine country of California. I colored the image with my ProMarkers, then die cut the frame with my newest Cheery Lynn die. The die cut is embossed, too. 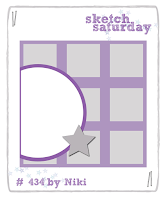 I mounted that to the purple card front with Pop Dots, giving some texture as well as dimension. I added the purple bow and the matted sentiment and it was finished. Very fast card, once the coloring was done. 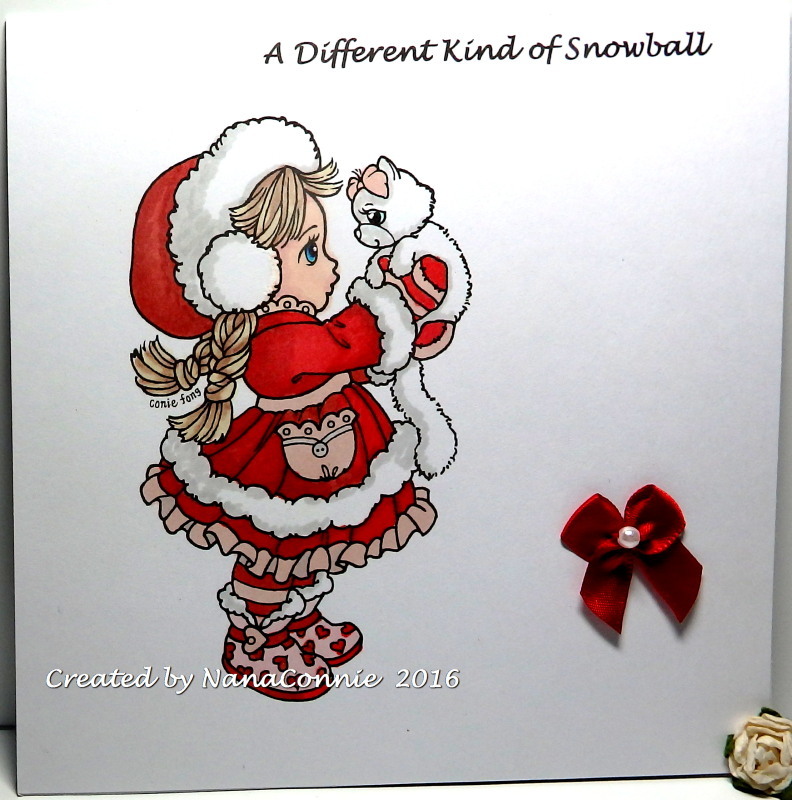 Today I have a really simple, single-layer, card with my favorite kind of snowball. :-D Considering that I grew up in southern California where it never snowed, and then was suddenly transplanted to Alaska for a two year tour with hubby, I've never really learned to appreciate the cold kind of snowballs. But the warm, fuzzy kind get me everytime! This is a Conie Fong image and I'm entering it into their Facebook "Monochrome" challenge. The image and the sentiment were printed directly onto the card front, then I colored the image with my ProMarkers. Even using the very heaviest CS that I can get through my printer, coloring with reds means that there was bleed-through onto the inside of the card. 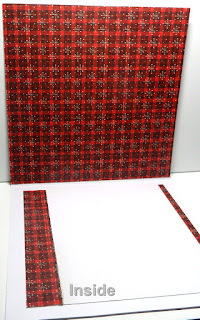 I covered that by using some Christmas-y plaid dp to decorate the inside. The tiny red bow is the only embellishment but it's just enough. I did want to keep this very CAS because that way, whomever uses it can mail it, if need be. It's going to be donated to one of my local children's hospitals. Colors from the inspiration photo at City Crafter. This is really a very simple card, intended to be masculine. Since our challenge theme involves 'leaves', I also used the Digi 3901 "Leaf" and printed it several times in different sizes. All the leaves and the pigs were colored with a combination of my ProMarkers and a few Copics. I hand cut everything, including the silly sentiment, then added everything to a kraft card base. I matted the sentiment and the pigs with black CS and mounted the pigs on dimension dots. As a final touch, I added the bow which originally had been white but I 'dyed' it with a ProMarker. I used my ProMarkers to color it, then cut it with a Stitched Scalloped Circle die from Memory Box. I die cut another plain Stitched Circle (Die-namics) as a frame and then layered that onto another, larger Stitched Scalloped Circle for an additional frame. I used very wide, sheer, pink ribbon and added a polka dot ribbon on top of that. Both of those are scraps left from another project which you'll be seeing in a couple of days. I die cut the sentiment tag and finally, made one of my 'bowtie' bows, using yet another polka dot ribbon from my scrap stash bin. I love the whole "Think Pink" or "Pink Ribbons" as an October focus for Breast Cancer Awareness. I'm one of the survivors (15 years this fall) and I take every possible opportunity to remind women to get those girls checked. Early detection is still our best tool in the fight against breast cancer. If you haven't scheduled your mammogram yet, pick up the phone and call for an appointment. 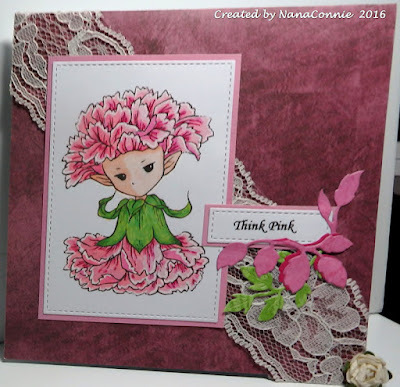 I'm celebrating my first Think Pink card this month with a darling image from AuroraWings called "Carnation Sprite." I began coloring with my ProMarkers, then added highlights to the pink petals with my Lyra pencils. I used a VersaMark pen on the very edges of the petals and heat embossed them with white EP. I started coloring the green part of the carnation but then found a perfect green dp scrap and paper pieced that one section, adding a few darker shadows to the tips with my ProMarkers. Both the image and the sentiment are cut with Stitched Rectangle dies (Die-namics), and then I matted them with pink dp. The darker dp for the background is a leftover scrap from a 12 x 12 paper that's been in my stash forever. I added the lace and then began layering everything together. 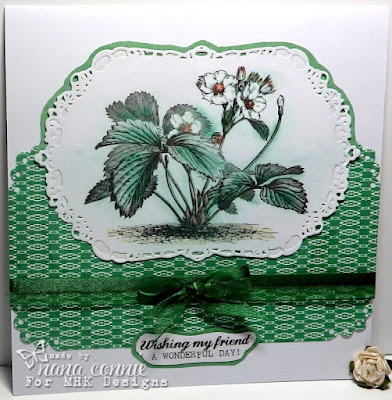 I cut the leaves from snippets of paper using two different dies (Cheery Lynn for the green leaves and both shades of pink leaves came from a rose die (Die-namites) but I used only the snipped leaves) and layered them around the sentiment. I colored the elf with my ProMarkers, then fussy cut him with scissors, and he's adhered with Pop Dots for some dimension. 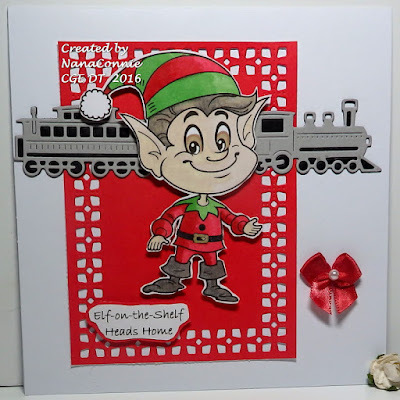 The background mat and the train cars are cut with Cheery Lynn dies. The sentiment is my own and is printed, then hand cut and matted. 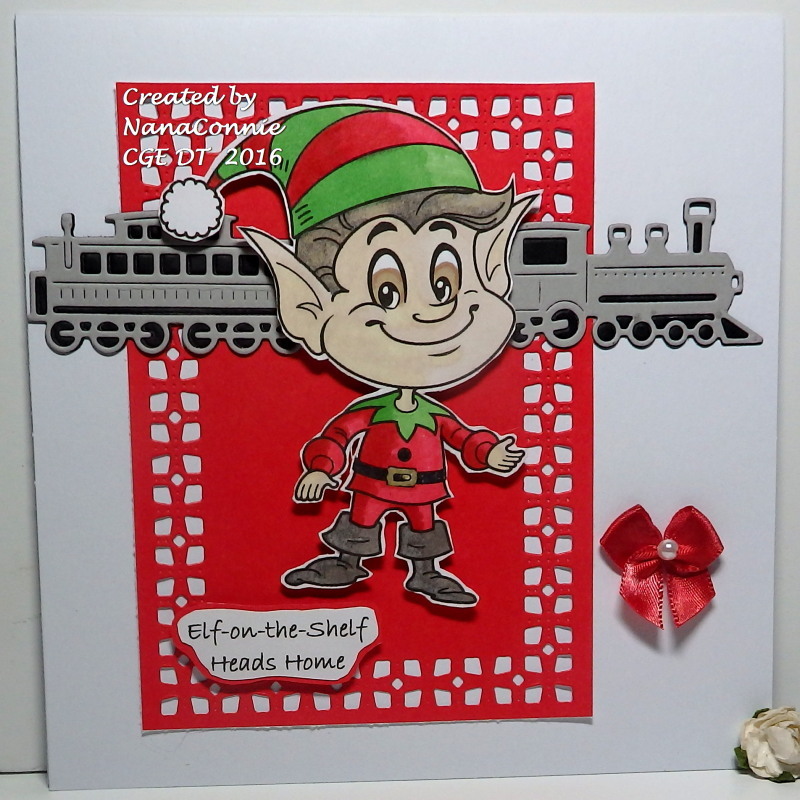 Since this is a masculine card, I decided all the embellishment it needed was a single, red bow.